Whether amateur or professional, serious cyclists want the assurance of quick and easy access to their water bottle during a hard ride―for health as well as competitive reasons. But when cyclists are speeding up and down hills or racing through rough terrain, it is not uncommon to see a water bottle fly off a bike due to vibration or obstacles. As a well-respected provider of cycling accessories to these demanding athletes, Netherlands’ Tacx BV wanted to put a higher level of bottle protection within the reach of every cyclist. To get the durability and flexibility they desired, they developed a bottle cage design utilizing carbon fiber, a material they had not used previously. Then, they turned to their distributor, De Monchy International BV, for advice. 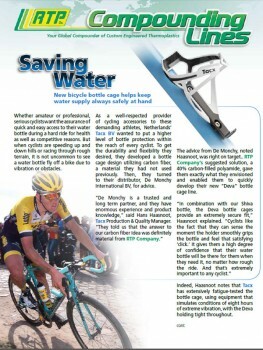 The advice from De Monchy, noted Haasnoot, was right on target.. RTP Company’s suggested solution, a 40% carbon-filled polyamide, gave them exactly what they envisioned and enabled them to quickly develop their new “Deva” bottle cage line. Indeed, Haasnoot notes that Tacx has extensively fatigue-tested the bottle cage, using equipment that simulates conditions of eight hours of extreme vibration, with the Deva holding tight throughout. Another pleasant surprise was how easy it was to work with the RTP Company material. “We were a little concerned about how challenging it would be to run the 40% carbon fiber in our injection molding machines, since we hadn’t done that before. In fact, RTP Company very kindly stood by and said ‘call us directly if you need any technical assistance at all,’” explained Haasnoot. “As it turned out, we didn’t need to take them up on that offer. But perhaps the best surprise of all has been the extent to which the market has embraced the new Deva line. “Although originally designed for a broader cycling market, it has already been specified by professional teams, including some riding in the Tour de France and other cycling classics,” said Haasnoot.